After a week of introductions and sight seeing is was time to get serious. The diary entry for Monday, September 22, 1975 is terse to the extreme: ‘language proficiency test’. . . The test was as straightforward as can be. We were given several texts, gradually increasing in complexity. We were asked to read them aloud, while a panel of teachers would ask questions about the meaning of particular words, or request us to rephrase a certain sentence. They were very skillful indeed as was reflected in the limited but pointed content questions with a more political nature. A certain work team in a factory was described as ‘the red flag of our unit (unit? I will come back to that term later) ’. So what does the term ‘red flag’ mean in this particular context? There was the neutral reply that was never really wrong, but also never to the point: ‘it means that they are standing out among their colleagues’. You needed to do better than that to be able to move onto the next level. You needed to show that you were familiar with the symbolic meaning of the color red and why ‘flag’ was used to symbolize standing out. You should not simply explain questions like that as purely political. The school needed to fathom to what extent each new comer could understand Chinese texts. Knowing words is the first level and being able to parse or rephrase a sentence the next. To dig deeper, down to the semantic layer of a text, you need to formulate proper questions and in 1975 the above was a very proper question. . . .
Are you eagerly awaiting further explanation about the proper reply to such a tricky political question? Get yourself a copy of the book and read all about it. Chris had to give up soon. He ended up in a beginners’ group, with which he was quite content. His aim was to learn to speak Chinese with a reasonable level of fluency and to learn about China. That suited his ambition to become a diplomat. I was different. As my field of specialization was linguistics (at least it still was at that time), I was aiming for the top: to reach native speaker fluency. During this test, my three years of self study during the final years in high school paid off again. After getting me sent to China after my freshman year, it now got me into the highest level group of BLI. My other group members were final Bachelor or Master students in their home countries. Divide et impera is a Roman adage, but it could very well have been Chinese. China is a large nation. No one emperor or government can rule it all, or them all. The only way out is to create differences between people through categorization, determination of people into various groups. The rulers then need to nurture a shared identity for each group, which can be used to create a certain level of strive, based on a mix of pride of being a member of certain groups, desire to become accepted by some other groups, and envy, the urge to reach what some others have already accomplished. This aspect of Chinese public administration was gladly embraced and continued by the Communist Party, when it gradually established power over China. Even after the Cultural Revolution, when Deng Xiaoping stated that it would be no problem if ‘some people would get rich first’, he did so knowing that those left in arrears would be stimulated to catch up. Maybe the top flaw of the Cultural Revolution was that all people came out equally poor. The salaries of a factory Director or its janitor should not deviate too much. The job of Director was open to all and would be given to the person who had accumulated sufficient political karma. Being selected for the post of Director was an honor, so no high salary was needed (at least so the political fundamentalists thought). A higher position would come with some privileges, but not with a high income. One result of this love for dividing people in categories was that we Dutch became part of the English speaking group. Western students were divided in two main groups: the English and French groups. Being part of the English group meant that our textbooks had Chinese – English vocabularies, explanations of grammar and words in English, etc. Moreover, all my class mates came from English speaking countries: UK, Australia, New Zealand and Canada. No, Americans were not allowed into China yet. The division was even more complex. Non-Western students also had groups of their own. They usually did not come to China as Sinologists; i.e., people interested in Chinese language, history, culture, arts or politics, but to pursue a professional training in medicine, natural sciences or engineering. Others (like Vietnamese, Albanians or North Koreans) also came to study German, Spanish, or other European languages in China, because it was politically difficult for them to do so in the countries where those languages were typically spoken. During meals, however, we noted that non-Western students had special teaching materials with more political content, introducing anticolonialist or postcolonialist thinking. Apparently, Western students were regarded as beyond the influence of the Chinese propaganda machine, so very little political propaganda was sent our way. For those who had only recently escaped colonialism, or were still ‘suffering’ from it, the Chinese authorities believed that a political message was suitable. . .
Group membership was further reinforced by the way we were housed in the various dormitories. All ‘English’ Westerners were housed in the same building, and several of my classmates were even living on the same floor as I was. Many faces you saw in class during daytime were also sharing your washrooms and toilets. We did not only know one another’s faces, but were also familiar with our classmates’ birth marks, scars and other more intimate bodily features; that is, those of the same gender, of course. Gender was yet another way of dividing us students. A dormitory was either completely male or female. Me and my class mates saw one another virtually 24//7 basis. However, this is how many Chinese lived as well. Most of our teachers lived in BLI dormitories. They would frequently visit each other in the evenings to discuss work related issues, and would meet again during their weekend shopping. The curriculum of my group included a surprising course: Classical Chinese. We seemed to be the only group with classes in Classical Chinese. Classical Chinese is not one particular language, but more an umbrella term for several literary styles of writings from the earliest literature to the second decade of the 20th Century, when vernacular Mandarin was made the national standard language. Classical Chinese grammar is the grammar of the texts written in the first century BC. That language was petrified and used for official writings until the end of imperial China and a few years beyond. The use of Classical Chinese can be compared with the use of Latin in Europe as a lingua franca for clerics and academics. The writings by Han Yu (768–824) would have been difficult to comprehend for Confucius who lived more than a thousand years earlier. However, Confucius would have understood the basics of Han Yu’s ideas. This was a double benefit to me. It added even more variety to the curriculum (which I will describe in a later chapter), and it addressed my anxiety to get familiar with that language as well. If I had not undertaken that adventure, I would have had my first lectures in Classical Chinese that same month. The course at BLI would at least give me a solid foundation for catching the following year. Everything seemed to be going my way and I was ready to start. After my first night in the Beijing Language Institute (from now on: BLI), I was eagerly awaiting my first day. The entry in my diary of that day (September 14, Sunday) reads: ‘Done some shopping. Met Chris at the airport in the evening’. This is the frugal language of someone more interested in observing than noting all observations down in great detail. Teacher Bi lived up to his promise of the evening before. He picked me up in the morning to show me around on the campus . . . It is definitively functional to start with the dining hall, as it was an essential facility to visit that morning. Teacher Bi started our conversation with the question: ‘Have you eaten yet?’ Everybody knows that food plays a central role in Chinese culture, but you don’t really know all its implications, until you spend some time in China. ‘Have you eaten yet?’ is one of the most common ways of saying ‘Hello’ in Chinese. It shows concern for the person addressed. The usual reply is ‘I have eaten’, which ends that (part of) the conversation. Theoretically you can answer negatively, but that will have consequences. The person who posed the original question may continue the line of questioning by inquiring why you have not eaten yet, or when you intend to eat. . . Most Chinese who have not yet eaten will still reply positively, because they are from the same culture, and do not want to create a ‘problem’ for the other party. That is the trick. It is not that different from the question ‘How are you?’ in our culture, that we usually reply by ‘I’m fine, thank you’, regardless how we feel. However, I did feel hungry that morning. This is, if I may say so myself, a good example of general information about Chinese culture that is woven into all chapters of this book. It is easy enough to learn a few of these ritualistic dialogues by heart to show off your command of Chinese, but you also need to acquire a feeling for the larger context in which these rituals are embedded. Another great example is the Chinese habit of greeting people they have not seen for a while with the set phrases: ‘You have gained weight’, or the opposite ‘You have lost weight’. Unfortunately, Westerners have become preoccupied with weight, and having gained weight is not likely to be taken for a compliment. Many Westerners therefore make the mistake of replying the greeting ‘you have gained weight’ with a denial. You shouldn’t; just reply with a smile. In a similar fashion, you should not react to the greeting ‘you have lost weight’ with ‘thanks’, as it may make the speaker think that having not seen one another for such a long time means nothing to you. The dining hall served set meals. Examples of each of the choices of the day were exhibited on a table, numbered. I do not recall the number of selections per day, but it must have been at least five, as for some reason, the phrase ‘Number five!’ keeps popping up in my mind, whenever I think of the dining hall of the Beijing Language Institute. Maybe that number was reserved for the most attractive meal, or maybe the set menu with the largest meat content, as I am very much a carnivore. So the drill was: make sure you have a sufficient stock of meal tickets, scan the table with examples of the set menus available for that meal of that day, line up behind one of the numbered windows and wait for your turn to shout ‘Number X’, where X stands for the set meal of your choice. The various parts of each set meal were already available on huge tables behind the counter, and the server would compose your meal by fishing the components of your selected meal; e.g., a meat ball, some vegetables, a cup of rice, etc. The final step was getting a drink from the beverage counter. Once you had your food, a new challenge was to scan the dining hall for people of your liking and to see whether there was still space available to join their table. The dining hall was to play a crucial role in the formation of social groups among the foreign students. During the first days, when everybody was new and unfamiliar, you would join your compatriots or classmates. However, after a while, you could discern groups who would share almost all meals together, because they perceived one another as like-minded. My main problem with these meal tickets was that I kept them in one of my back pockets, and kept forgetting to take them out before washing my trousers. I have found myself forced to dry them carefully on the radiator in our room several times.
. . . we arrived at the back gate. It was not called Back Gate. The Chinese geographical perception is based on the quarters of the compass. The back gate of the Institute was called: West Gate. After a few steps along what again struck me as a country road (I saw fields with crops on both sides), we arrived at the street with the bus stop, crossed it, and entered an area that what was to become my main source of daily necessities for the coming year: the Wudaokou shopping area. . . The area still exists and has turned into a very lively shopping space (a real shopping center). There are more shops and restaurants, but now most of them are privately operated. There is also a station for Subway line 13, which makes it much easier for current students to hit the town. 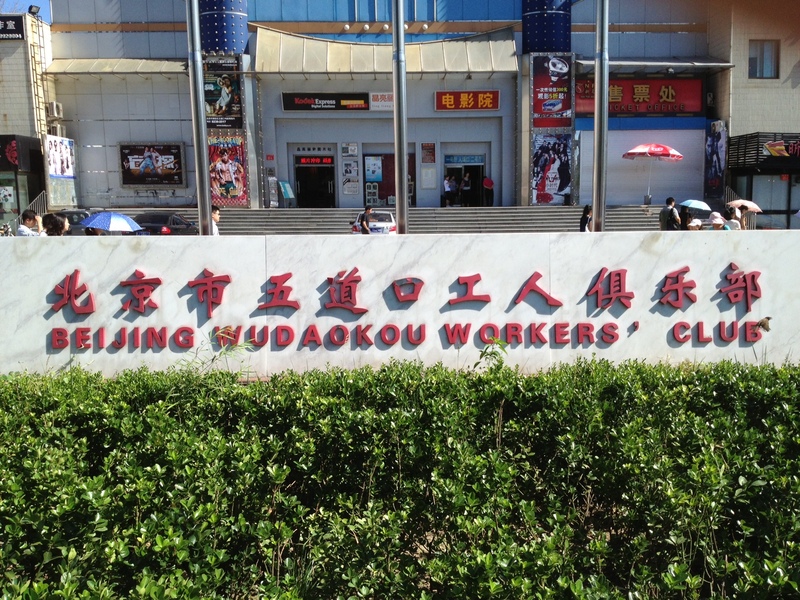 At least one building of my past is still standing strong: the Wudaokou Workers’ Club. We watched a revolutionary opera there, as I will relate in more detail later. It has been turned into a cinema. My diary does not include my shopping list of that day . . . I most clearly remember two items: toilet paper and beer. Toilet paper is undeniably a basic necessity. Later, we would find out that the Chinese students often used any kind of paper available, like used pages from notebooks, old newspapers, etc. We preferred the real thing; however, unproletarian it might have been. The most unproletarian aspect of the toilet paper I bought that day was its color: pink. If people should shun wearing colored clothes, why then was it OK to wipe ones behind with pink toilet paper? 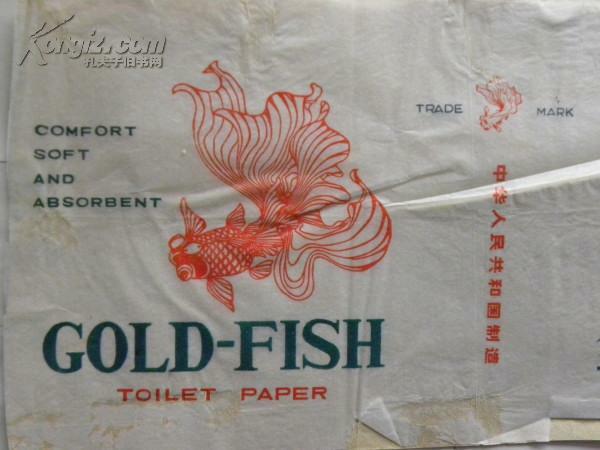 Moreover, the paper was branded ‘Gold Fish’. Branding products was a capitalist habit, but even in the China of 1975, most products were branded. However, many brands seemed to be completely mismatched with the product they were linked to . . . If you think that the toilet paper was peculiar, wait till you learn about the place in which it was used. Urinals were quite similar to those we were used to in Europe. No problem there. For the more serious toilet activities, called ‘big convenience’ in Chinese, we had to learn to squat. Squatting toilets are known in some places in Europe as well, but for most of us it required some time to get used to doing your big thing squatting. Moreover, that area of the toilets did not consist of closed rooms, but low walled cubicles. Especially when the taller Westerners like the Dutch, or the Danish, were squatting there, their heads would stick out above the walls of the cubicles. Therefore, an outside observer could guess the stage of their activities by their movements, and above all the color of their faces. Except the bouts of diarrhea we would suffer after eating in a smaller restaurant, most of us were living on low fiber diets. This caused slow bowel movements and constipation. Defecating often required considerable pushing, which would also push more blood to your face. An early morning visit to the toilet would often show several faces sticking out from the cubicles, and you knew that those with red faces were engaged with the most critical step of the defecation process. In this respect, no one beat Chris who often took his pipe and his reading matter with him to the toilet. A red face with a smoking pipe can be just a little too much to handle, early in the morning. Back in my, still single, room, I stowed away the pink toilet paper in a drawer, so I could attend to the other item that I recall having bought that morning: beer. . . It was produced by one of the older Beijing breweries, Shuanghesheng, but during the Cultural Revolution its name had been changed to Capital Brewery. I guess that was a more proletarian name than the traditional one that refers to the two original founders who would have been branded capitalists, had they been still alive then. The brewery still exists, but its name has changed a few times since. It is now owned by one of the emerging state capitalist companies, Qingdao (Tsingtao) Group, the famous beer from Shandong province, well known outside China as well. This is another recurrent type of commentary in this book: background information on things Chinese. I don’t do so systematically, but whenever I believe it is useful, I add some geographic, historic, or cultural background, when typical Chinese artefacts or places pop up in the text. Later that day, I asked to join Teacher Bi back to the airport to welcome Chris. He arrived on the same flight as I had taken one day earlier. The following Monday morning was a Dutch day. We went to our Embassy, as agreed with Ronald during Chris’ arrival Sunday evening. It was an occasion to take our first long ride on bus 302, all the way back over the Third Ring Road to the Sanlitun Embassy quarter. There was more to see during daytime, but possibly because it was our first time, it seemed like a very long trip. It also was our first experience with the then common practice to give foreigners a seat on the bus. The ticket sellers would often loudly request people to cede a seat to the foreigner. We found this extremely embarrassing, but even if the people who stood up had hard feelings about it, they were very apt in hiding them. . . The Embassy loaned us bikes, so we could ride back to the Institute. This was undoubtedly a good exercise, and saved us some of the embarrassment of being forced to take away other people’s seats. It also allowed more interaction with the other people on the road. Many trucks loaded with people, ready to help with the harvest, were passing us and we exchanged friendly greetings with many. That was definitely in sharp contrast with all those evil empire stories. The people were friendly, and were amused to see foreigners riding a bike that was slightly too small. Chris’ pipe also drew attention.
. . . And attention we got plenty of, when his pipe dropped from his mouth, and we had to dismount to pick up the pieces. BLI organised a number of outings in school buses for the newly arrived students. During that first week we visited the Forbidden City, the Summer Palace, Tian An Men Square, and the Temple of Heaven. We also saw a table tennis game and a football match. We were briefed about the dos and don’ts and all kinds of regulations, while students from various other countries kept arriving each day. This chapter ends with a fascinating anecdote. The last Sunday of September 1975, I went out for a bike ride on my own. . . A boy of about 12 -13 suddenly appeared from an apple orchard and yelled at me in English: ‘What time is it?’ . . . I now regularly cover the route from Amsterdam’s Schiphol airport to Capital Airport of Beijing in about 9.5 hours. It took me a little longer back in 1975; 38.5 hours more, to be precise. 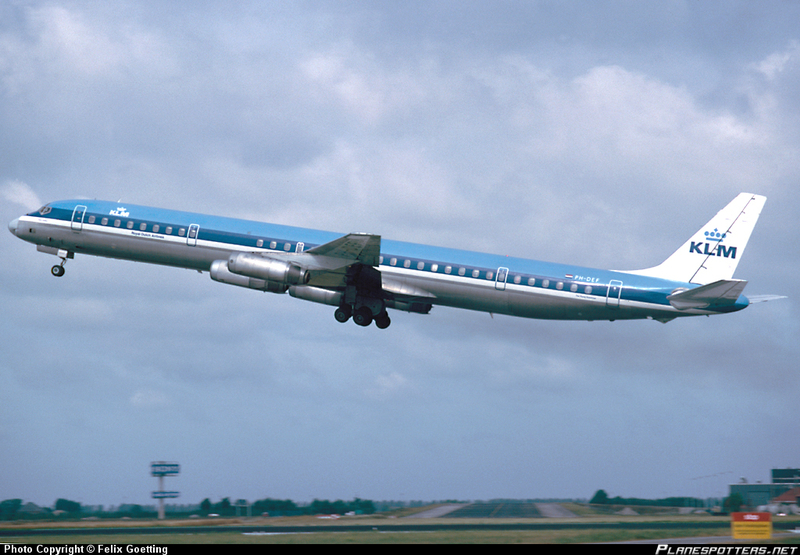 The route Amsterdam – Hong Kong was serviced by a DC-8, a kind of flying bus, according to our present standards. We had to stop to fuel every few hours, which meant several opportunities to stretch our legs and inspect increasingly exotic airports, but also added many hours to this, already long, flight. We arrived in Hong Kong about ten in the evening. Chris started with bad luck, as his luggage was still in Amsterdam, when we arrived in Hong Kong. We agreed on the spot that I would move on to Beijing the following day as planned, while Chris preferred to stay and wait for his luggage. We took a taxi straight to our hotel, the Ambassador Hotel on Hong Kong’s famous Nathan Road, also known as the Golden Mile. However, despite that perfect location for young adventurers like us, we decided to stay in the hotel that night. We were happy to have a real bed to sleep in, after such a long flight in a cramped airplane seat. The unknown darkness of Hong Kong by night probably also frightened us, although neither of us would have been willing to admit it. Hong Kong was still the city of Suzy Wong, the famous film prostitute. I had hardly entered my room, when I was called by a lady greeting me with the line ‘Hello; I am Jenny’. I replied that my name was Peter and that I was very tired after my long flight. To my surprise, she was not very persistent. Maybe she had high hopes to catch a man in need sooner or later that evening. However tired I was, I still turned on the TV set to get my first Chinese TV experience, only to find out I had a choice between a traditional Cantonese opera and a western with John Wayne, dubbed in Cantonese. My first encounter with Hong Kong culture was not an overwhelming success, so I turned in and fell asleep instantly. Rereading this, it strikes me even more as surprising that two young guys in the prime of their lives could resist hitting the streets of Kowloon immediately after throwing down their luggage. We must have been completely focused on our goal: reaching Beijing. We were tired of course, and Chris was in a very bad mood, knowing that he had to spend the following day in the same clothes as when we arrived. If you have not yet seen The World of Suzie Wong, get a copy. It is worth the effort. The border between Hong Kong and China was still a kind of twilight zone in 1975. It was the Crown Colony Hong Kong, a part of the British Empire, but when properly positioned, you could actually look into China and see what happened on the other side. Watch towers had been erected for tourists to catch a glimpse of the rural village at the other side of the border river: Shenzhen. What currently remains of that village is its name. It is now known as the Shenzhen Special Economic Zone and is at least as modern as Hong Kong. You can still go there by train, but when your final destination is Guangzhou, your train may rush through, with Guangzhou East as the first stop. It has been set up as a showcase of modernizing China, but although there is still a real border, with guards and passport control, if you want to savour that experience, you need to take a local train, or other type of transportation to go to the border and walk through all those formalities. Back in 1975, I had to carry my luggage over the bridge. 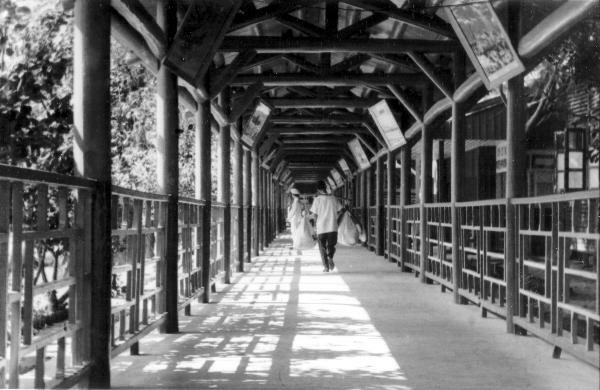 The wooden bridge was really rudimentary. I could see the border river flowing under my feet. The passport check was a first surprise. After hearing and reading all those stories about the suspicion of the evil empire to foreigners, that formality struck me as ridiculously short and relaxed. No questions, not body check, no request to inspect my suitcase, nothing more than another stamp in my passport. After my first few steps on Chinese soil, I was shown a bench to wait on for another local train that would take me further to Guangzhou. We Dutch are usually not keen on meeting fellow countrymen abroad. Unfortunately, we are a globetrotting nation and you can find us in all corners of the world. I had unexpected company during my trip from Hong Kong to Beijing. The visa officer of the Dutch Embassy in Beijing and his wife and son happened to be on the same train. Although we Dutch are not always keen on meeting compatriots abroad, let alone engage in in-depth conversations with them, in those days and that part of the world, we both found it an incredible coincidence. He had already some experience in Beijing, so I was eager to pick his brain about all aspects of Beijing life, while for him I was another Dutch man, so he was looking forward to several hours of serious discussions . . . about football. Unfortunately, neither of us lived up to the other’s expectations. He could not inform me about more than the expatriates’ life, and I am not a sporty person, not now and not then either. Bad luck, but I gave me more time to take up my surroundings. After all, these were my very first moments in China. I was eager to see in what ways it differed from what I was used to at home. 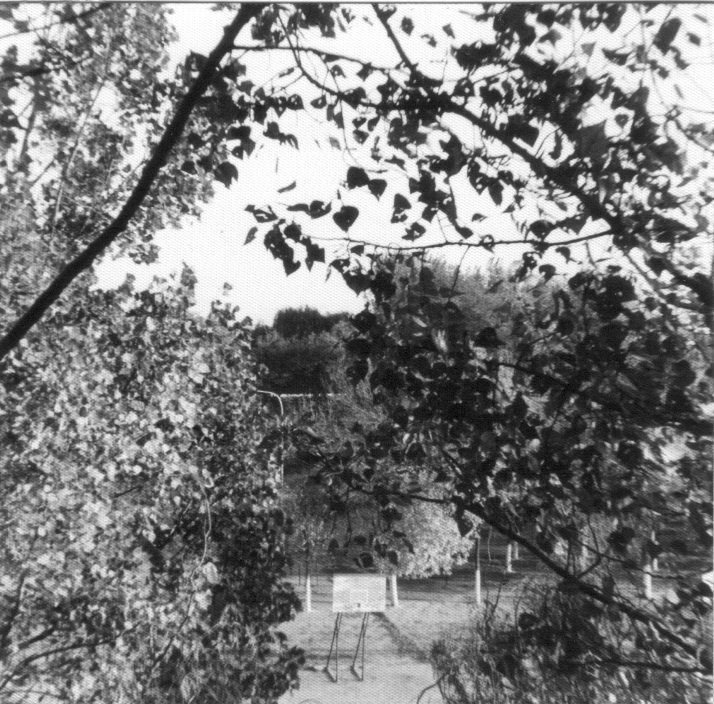 The railroad and the station were elevated above the surrounding fields. I noted a balcony besides my bench and I stepped onto it to look down and see whether I could spot something really new outside. Right under me I saw a young female guard, dressed in a grey uniform with a red button on her cap, holding a rifle. At least, that was a scene that I recognized from the publications about China. However, despite her uniform and weapon, she did not strike me as frightening. She was just there, doing her job. We actually looked one another in the eyes, and she seemed to gauge me with at least as much curiosity as I inspected her. We were absorbing one another, and the moment she also became aware of that, she smiled at me. The literature had never prepared me for that. Rethinking that situation now, I realize that, while I was intrigued by the combination of an attractive young woman and her uniform and fire arm, she on her part must have been puzzled by that young Westerner who looked like a man, but wore his hair unto his shoulders. Don’t forget it was 1975, and most young European men had long hair. Ha, my long hair would trigger more comments and jokes during the year to come. Still, it also shows how tolerant China was for people who looked different from what was regarded as normal. In those days, men with beard or long hair had problems entering some East European countries. The train for Guangzhou arrived, with the man despatched to accompany me to the Guangzhou Airport. Having long hair was tolerated for a European man, but travelling on his own in China was another thing. Teacher Bi, the person in charge of the foreign students at the Beijing Language Institute. His full name was Bi Jiwan, as Chinese are used to put the family name first. However, I only learned his full name much later, when Google started to be used as a verb and I had googled his surname in connection with the Beijing Language Institute. 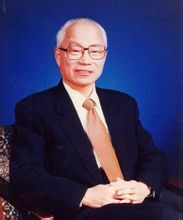 That proved to be an interesting search, as Teacher Bi had made an impressive career after the start of the economic reforms in 1980, spending almost two decades at various universities in England and North-America. I now also know that before his assignment to the Institute, he even spent a year in Bagdad in 1962-63, teaching Chinese, and was involved as an interpreter in some reconnaissance work along the Sino-Burmese border in 1960. This is more than a simple human interest story. It says something about the quality of the staff of the Beijing Language Institute of that time. This was no common man. Our coming to China to learn Chinese and acquire first-hand knowledge of China meant something to the Chinese government. They furnished us with a team of highly qualified teachers and supervisors; a privilege that, in hindsight, has been underappreciated by us. 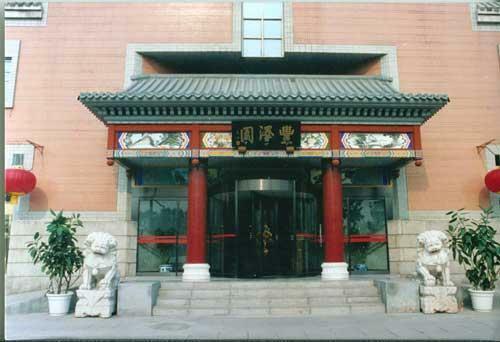 Teacher Bi was assigned to the Beijing Language Institute and within the school as the supervisor of the foreign students. Knowing what I know now, it might not have been his ideal career, but if that guess is correct, he surely performed that task with grace. Ronald, whom you met in the previous chapter, during my birthday dinner, was there as well. Dutch students did not arrive in China that often. Actually, so very little happened anyway that was worth reporting about to the motherland, that it was worth the effort to meet me, so he could send a memo about it to the Ambassador the following morning. I will skip my first encounter with him as well as the ride to the Institute. I was getting dark, so I was not able to savour the scenery as I did from the train to Guangzhou. The final excitement of that eventful day was the arrival at the school. Arriving at the campus, we immediately drove on to the dormitory. It was late, particularly for Chinese standards, so I was recommended to go to my room, unpack and get a good night sleep. That was good advice by any standard. The building was a block, like all dormitories. The two-person room was small, but well furnished. Actually, it was so well furnished, that it was difficult to move around, even for one person. Per occupant, there was a bed, a wardrobe, a table with a lamp and a chair. The floor was concrete, and the walls made of white plaster. The room had a great view, on the playground in the centre of the campus. It needed to get used to, but it was only slightly smaller than the room I used to rent in Leiden, although I had that room all for myself. The only piece of furniture that was missing in Beijing was a sofa. However, we acquired the habit of using our bed as a sofa, whenever the wooden chair started to feel a little to ‘wooden’ on our behinds. Teacher Bi was eager to say goodbye after he had showed me to the room. He promised to pick me up the following morning to show me around and to point out the nearest shops to purchase some daily necessities. . .
After that eventful day that started by waking up in a Hong Kong hotel and ended in settling down in the dormitory of the Beijing Language Institute, my mind needed a rest to process all the impressions of the day. I switched off the light and turned in, to spend my very first night in China. No Jenny called me that evening. China has been dominating the media for a number of years. Apart from the occasional problems with unrest in peripheral regions, most of if the media stories are positive, raving about the high speed of economic development in one of the world’s most populous nations. Entertainment in China’s major cities like Beijing and Shanghai is on par with that in the big cities of the world. Your Chinese friends seem to change their mobile phones about twice per year, lest they will be regarded as out of fashion by their peers. They swapped their bikes (do you still remember Katie Melua’s hit?!) for cars years ago, clogging the roads of the nation’s cities. Some Internet content may be restricted there, but China rules where Internet technology is concerned. I myself hardly receive emails from China anymore, at least not personal messages from friends. That communication has moved on to WeChat, the Chinese communication tool that is conquering the world. China has organized the Olympics and the World Expo. We are only waiting for the next global event to go to China. You could easily forget that all these developments have taken place at an incredible speed. China has gone through changes in about 3 decades that have taken the Western nations at least double that time. You may even have seen photographs of people paraded around with big hats on their heads and boards around their necks stating their sins, like being a ‘capitalist roader’ (what the h… is that!?). But . . . what do you know about the daily life of Chinese citizens in that era? Surely they could not spend all their days waving little red books and parading their fellow citizens? They must have got up in the morning, eaten breakfast, went off to work, just like people in other parts of world. It is easy enough to find books about the political upheaval of that era in China, but much harder to learn about the lives of ordinary citizens. A few books have been written by Chinese living abroad, but they seem to emphasize the hardship of the families that were on the wrong end of the political equation at that time and emphasize the hardship of those criticized as ‘rightists’. I have the privilege of being able to spend a year in China as a student from September 1975 to August 1976, a month before Mao died and the Cultural Revolution ended. Because it was that final year of the Cultural Revolution, it turned out to be quite an eventful year. I recently published a book about that year in China entitled One Turbulent Year – China 1975. It is based on the diary that kept during that year, but it is much more than a simple story about what I did and experienced on a day to day basis. The book is description of the everyday life in China as experienced by one of the first groups of foreign students allowed in, when China carefully opened its door a little towards the end of the Cultural Revolution period. I use ‘students’, plural, because I am not the only central character in this book. Soon after my arrival, with another Dutch student, we formed a small group of close friends willing to absorb China with an open mind. Surely, our life during that year did not reflect the lives of the ordinary citizens of China’s capital, but because we cycled to the city on our bikes, rode through in crowded buses, shopped in local shops and dined in local restaurants, we were undoubtedly the ones closer to the Chinese citizens that any other group of foreigners living in Beijing. In the following items of this blog, I want to share parts of my book with you by copying sections from the chapters, adding some new personal comments. I hope that this blog can serve as a time window to the China of only a few decades ago, and that it will show in what ways life differed then and in what other ways the China of the 1970s reflected Chinese culture as much as that of the China of the 21st Century.